Bemis Center for Contemporary Arts was created by artists, for artists. In 1981, founders Jun Kaneko, Tony Hepburn, Lorne Falk, and Ree Schonlau established the organization as an Artist-in-Industry program called Alternative Worksite which placed artists at industrial sites. It soon became clear that the gift of time, space, and support fulfilled a vital need for artists at the leading edge of their disciplines. 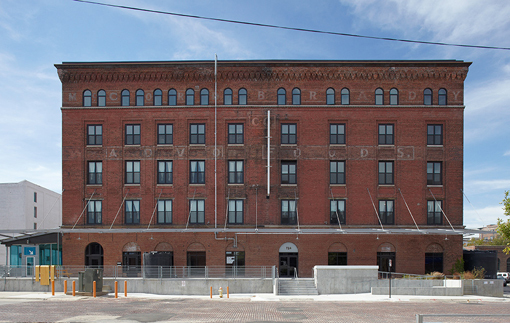 With the help of public and private partners, renovation began on the vacant Bemis Bag Warehouse in Omaha’s historic Old Market. In honor of its new home, the organization was renamed The Bemis Foundation. The startup Artist-in-Residence program served as a laboratory for artists to research, experiment, and take creative risks free from expectation. In 1995, the organization moved into its current headquarters, the 100,000 sq. ft. McCord-Brady wholesale grocery warehouse, and became Bemis Center for Contemporary Arts. Quickly gaining a reputation as an international leader in the field of artist communities, Bemis Center began expanding programming to further support artists. The organization created an ambitious Exhibition Program, developing projects with international artists that focus on site-specific, immersive, and socially engaged work. Public Programs at Bemis are designed to ignite civic engagement through the development of professional development for artists, education initiatives, and community collaborations. These additions have supported artistic processes and catalyzed artists’ work to engage and challenge the public. In 2009, Bemis Center launched the Building | Bemis capital campaign. This $2.6 million expansion included the addition of five new live/work studios, a 2,000 sq. ft. multipurpose space, and a loading dock. Construction was completed in October 2011 with the renovation of the 9,000 sq. ft. Okada Sculpture & Ceramics Facility. Nearly 900 artists-in-residence have called Bemis Center home, participating in global conversations at the forefront of contemporary culture. Today, Bemis Center remains an artist-centered organization whose sole mission is to support artists and cultural production. This mission is why Bemis perpetually strives to give the institution to artists, empowering them to take time, take risks, and create art that gives meaning to the world around us.